With the Flag State Performance Table of the International Chamber of Shipping (ICS), shipowners can get a quick overview of the quality of the 117 flag states worldwide. The German Flag has long been exemplary in all areas and once more ranks among the best this year. In their Flag State Performance Table, the ICS publishes a concise overview of how well the flag states organised their fleet over the last year. The performance table helps shipping companies choose a reliable and safe flag. In the ICS ranking, a green marking represents positive performance of the individual criterion while a red one stands for failure of performance. Just as in the previous years, the German Flag is fully in the "green". Thereby, Germany in one of 22 of the best flag states among a total of 117 the ICS compared. Germany has ratified all important maritime conventions and works actively in and with the IMO. German-flagged ships come off well in port State control inspections and the average age of the fleet is relatively low. The recognized organisations working for the German Flag also show good results. On the STCW "White List", Germany stands for high-quality training of the next generation of seafarers and assures fair working and living conditions on German-flagged ships. It remains valid: You can rely on the quality of the German Flag! Convincingly establishing safety awareness on board can only work if all crew members are actively involved. Hazards can be found anywhere safety provisions are only followed half-heartedly. With their new Safety Bulletin, the Ship Safety Division of BG Verkehr gives practical advice for sound safety awareness on board. The first topic in line of the new Safety Bulletin is Enclosed Spaces. In the beginning of the notice, an example from day-to-day work on board shows how and where hazards may occur. Because, especially when something is done on a daily basis, carelessness easily creeps in. Moreover, the examples show with real incidents where potential weak spots of the occupational health and safety measures of specific operational procedures lie. The safety information is published as a bulletin, because a convincing and successful safety concept needs to be continuously further developed. The bulletin issues are supposed to instigate to always question and advance the existing occupational health and safety measures on board together. This means that crew and shipping company have to work together to ensure that safety measures are both suitable for every day work and at the same time meet the legal and company requirements. Where a safety measure proofs useless, a new way to implement safety needs to be developed together. Only if everyone supports the safety concept on board, will it be consistently implemented. Read more about how to raise safety awareness on board under our heading "Occupational health and safety". In its Annual Report 2018 on maritime labour rights, the Ship Safety Division of BG Verkehr shows at a glance how it monitored compliance with the provisions of the Maritime Labour Act over the last year. Since last year, the BG Verkehr has been issuing Maritime Labour Certificates and Fishing Labour Certificates electronically. The Ship Safety Division also published its MLC-Guidelines in a completely revised format. Since 2013 the Maritime Labour Act implements the International Maritime Labour Convention (MLC) on ships under German flag. With these provisions, mandatory and comprehensive regulations regarding working and living conditions of seafarers have been established. Important topics like hours of work and rest, food and catering, payment of wages, occupational health on board and many more are now clearly regulated and are verified on a regular basis. 40 MLC surveyors inspect international ships abroad and nationally regarding their compliance with the requirements of the Convention for the Ship Safety Division of BG Verkehr. The employees of the ISM / ILO Department attend to complaints of seafarers about working and living conditions, approve private recruitment agencies and ensure that shipping companies under German flag are informed about current topics of this topic area. The ISM / ILO Department has now published its Annual Report 2018. Since last year, the German Flag has been issuing Maritime Labour Certificates and Fishing Labour Certificates as electronic certificates. The validity of a ship certificate can be verified electronically with a certificate identification number on this website. In the middle of the year 2018, the fully revised Guidelines on the implementation of the Maritime Labour Act on board of German flagged ships (this version in German only) was published. Compared to its previous version, the experts of the Ship Safety Division completely revised the topic area health and safety protection and accident prevention. New information about drinking water on sea-going ships as well as maps of the trading areas for medical equipment were added. For the first time, the Guidelines contain specific information about contracts of employment and hours of work and rest for work on board fishing vessels. The Ship Safety Division of BG Verkehr has changed their approval practice regarding in-water surveys of German-flagged ships. As of now, the inspection of the ship's bottom can also be done inside the water if a ship does not have an additional class notation for in-water surveys (e.g. "BIS", "IW"). Under the SOLAS Convention (Regulation I/10(a) in part B), two bottom surveys have to be conducted for sea-going vessels within a 5-year period. For cargo ships younger than 15 years, the first survey is not required to be done in drydock but can also be conducted in the water by a diver. So far, the German Flag demanded an additional class notation (e.g. 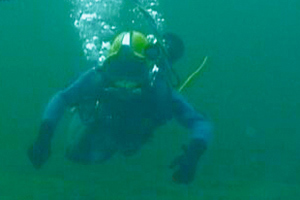 "BIS", "IW") or appropriate structural conditions for an in-water survey – among other things, fixed markings at the hull below the waterline and safe access to the sea chests, rudder bearings and stuffing boxes for the diver. Other flag states or classification societies use the current IACS UR Z 3 Rev.7 of January 2018 (the abbreviation "UR" means "Unified Requirements"). The Ship Safety Division also has decided to follow these rules of the International Association of Classification Societies (IACS) for sea-going vessels under German flag from now on. if damages are detected during the in-water survey, the class surveyor may order a drydock bottom survey. The German Flag State Administration gets more and more digital. In addition to e-certificates, online application procedures and many other interactive applications on the website, the Hamburg shipping register, as the first shipping register in Germany, will become digital. A user-friendly and time-saving procedure will facilitate the registration of ships for the shipowners and the administration staff. "Time is money" – this is especially true for the shipping industry, because any day that a ship is not in transit, it is costing the shipowner money rather than making it. So far a ship registration may take up to a week. During this time the documents are being processed, handed from one department to the next and are thoroughly checked legally. To considerably reduce this bureaucratic effort, the Hamburg shipping register has decided to undergo a comprehensive digitalisation. On 1. January 2020, the first digital shipping register in Germany will be able to carry out registrations and register entry changes in less than half the time thanks to online applications, automatic processes, such as call sign designation and verification of double naming, as well as digital files. The Hamburg shipping register counts almost 7,000 entries of which 4,866 are of sea-going vessels. This makes it the largest shipping register in Germany. Last year it had 420 new entries and 3,500 applications for changes. The registration of a ship at the competent district court of the home port is required when a new ship is built or a ship changes flag. Applications for a change of the entry need to be filed when for example a ship undergoes a conversion or changes its name. The online application allows for a submission of the application forms independent of the opening hours of the authority from all around the world. It will also not be necessary to visit the shipping register personally for a file inspection, this can rather be done at one's own desk. Some other shipping registers have already shown interest in this digitalisation project. The possible digitalisation of other shipping registers could facilitate a closer cooperation in the future. The digital shipping register will be a real gain for the maritime and legal location Hamburg and a valuable service for the shipowner. In March of last year, the BSH tested the first maritime Galileo satellite navigation receiver worldwide to be used on board. In March of last year, the BSH tested the first maritime Galileo satellite navigation receiver worldwide to be used on board for an EU approval. This receiver of the company Fugro Norway AS with the name Fugro Oceanstar had already been approved as a receiver for GPS and the Russian system GLONASS. Aside from the real satellite environment, the BSH also used an extensive satellite simulation for the testing. The simulation facilitates the near optional combination of all signals available for civilian application of the satellite navigation systems GPS, GLONASS and Galileo. 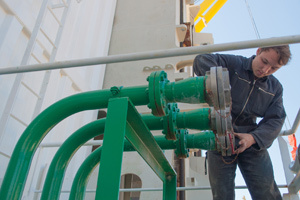 The approval after the completion of the testing was carried out by DNV GL Group. Maritime shipping too has to become (even) more environmentally friendly. Therefore, since the beginning of 2018, the EU prescribes that the shipowners have to trace the emissions of their ships. This requirement of the so called MRV Regulation are now supplemented with new rules by the International Maritime Organisation IMO. We explain the differences between the two systems. The Regulation (EU) 2015/757 on the monitoring of carbon dioxide emissions from maritime transport applies since 2018. This regulation is better known under its abbreviation MRV which stands for monitoring, reporting and verification. Now the IMO has added another system: the Data Collection System (in short: DCS). In this system the fuel consumption of maritime ships is established. Both procedures resemble one another and shipowners can use some of the collected data for both systems. But there are also differences. For example, in Germany different authorities monitor the compliance of the requirements. We have compiled the most important differences for you in the following table. Below the table, you will find more detailed information about the two procedures. The maritime transport regulation EU MRV ((EU) 2015/757) is applicable for ships of 5000 GT and above which conduct commercial voyages to or from a port or between ports in the European Community. The EU Regulation stipulates monitoring of carbon dioxide emissions from maritime traffic with a monitoring concept verified by an accredited verifier. Annually, an emission report for the ship, based on the collected data and positively assessed by an accredited verifier with a Document of Compliance, is reported to the Deutsche Emissionshandelsstelle until 30. April of the following year. This Emissionshandelsstelle is part of the Federal Ministry for the Environment. The Document of Compliance is to be carried on board the ship. Emissions have to be collected since 1. January 2018. The first Emission report is due on 30. April 2019. Further information is given in our ISM Circular 01/2018. The IMO has approved a system to record data about fuel oil consumption of ships (DCS) for ships on international voyages with 5000 GT an above and has included this in the MARPOL Convention Annex VI. For the implementation, the SEEMP (Ship Energy Efficiency Management Plan) has been extended with a part II: the ship fuel oil consumption data collection plan. For sea-going ships under German flag, the shipowner submits the SEEMP with the supplemented part II to a recognised classification society for verification. The class submits their Survey Report or the Confirmation of Compliance - Ship Fuel Oil Consumption Data Collection Plan to the Ship Safety Division of the BG Verkehr for approval which issues the relevant confirmation for the ship. The approval by the Ship Safety Division has to occur until 31. December 2018. The shipping company submits the collected data to the ship safety Division until 1. April of the following year. The first submission is due on 1. April 2020. The collected data on the fuel oil consumption are entered annually into the IMO database of fuel oil consumption of ships by the Ship Safety Division or the commissioned class. For each ship under German flag, the Ship Safety Division issues a Statement of Compliance - Fuel Oil Consumption Reporting to confirm the proper submission of the annual consumption report to the IMO. Further information and details about the required data and the various measuring methods are given in the ISM Circular 05/2018. The German Bundestag paved the way for the German ratification of the convention with the unanimous adoption of the draft law on the Ship Recycling Convention of the IMO and takes a stand for safe and environmentally sound recycling of ships. Since the 1970s, ship breaking has shifted from Europe to Asia. Shipyards in Europe had become too small for large sea-going vessels and an expensive work force as well as strict environmental provisions gradually drove up the costs. In Asia ships are broken down on beaches instead of in shipyards. The work and wage conditions as well as the pollution by these ship breaking places has long been criticised internationally. With the Hong Kong Convention 2009, the IMO has created requirements and regulations for safe and environmentally sound recycling of ships. The Convention does not apply to ships under a gross tonnage of 500 and ships that have solely been deployed on national voyages. However, these ships should also be recycled in a sustainable way and with consideration for the environment. Both the EU Ship Recycling Regulation (EU SRR) and the German law for the ratification of the Convention are supposed to raise awareness of the topic with other flag states so that they might join the Convention. The Convention will only come into force once at least 15 parties with a total of 40% of the world gross tonnage and at least 3% of the annual global total tonnage of recycled ships have ratified the Convention. The Federal Ministry of Transport and Digital Infrastructure has entrusted the Ship Safety Division of the BG Verkehr and the Federal Maritime and Hydrographic Agency (BSH) with the enforcement of the Convention in Germany and on ships flying the German flag. In the future, the Ship Safety Division will issue a document that certifies that an Inventory of Hazardous Materials exists and complies with IMO requirements. The Inventory lists all hazardous materials contained in the ship's structure or equipment, their location and approximate quantities. The inventory must be kept up-to-date throughout the whole operational life of the ship. Prior to the voyage to the ship recycling facility, the Ship Safety Division conducts a final survey and declares the ship clear for recycling. During port state control inspections, the ship will also be checked for compliance with the Convention. The BSH will be the competent authority for the authorisation of national ship recycling facilities. Prior to the recycling of a ship, the agency approves the Ship Recycling Plan of the recycling facility. 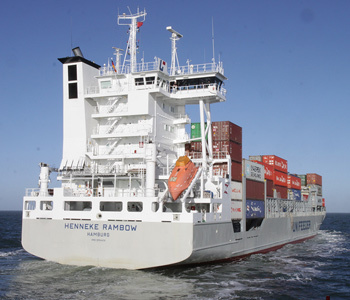 New requirements for medical equipment on board of merchant ships flying the German flag have come into force. 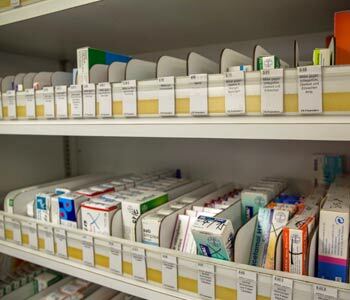 The new "State of medical knowledge" includes, besides an equipment list, practical information on the storage of drugs and medical products on board. Shipowners only have to implement the changes of the medical equipment by the next annual inspection. More information on this topic can be found in our section on "Maritime Medicine". The changes in comparison to the previous state of medical knowledge are given in an information leaflet (in German only). The Seafarer's Compendium of the BG Verkehr has become a popular standard work for any question regarding safety on board of sea-going vessels. In addition to the hardcopy version, an award-winning digital version for mobile devices is now available. By now on almost every German sea-going ship, a copy of the compendium "Occupational safety and health protection on board of merchant and fishing vessels" (Handbuch See – Arbeitssicherheit und Gesundheitsschutz in der Seeschifffahrt und Fischerei) can be found. 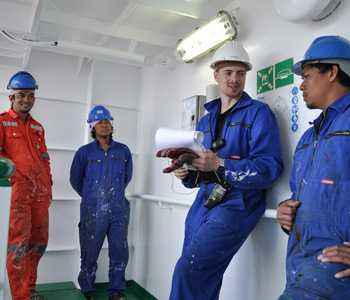 69 modules illustrate with few words and "talking" pictures to what seafarers have to pay attention in order to neither put themselves or anyone else in danger. During an instruction about certain topics, the corresponding modules can be used as a basis for remarks. This book of reference is now also available as digital version for mobile devices. Winner of the "eLearning Award 2018"
The implementation of the well-established compendium electronically is fashioned to serve the particular conditions at of maritime shipping. Independent of time and place and an internet connection, the essential information is available to the user both on- and offline. The user can readily change between German and English. A keyword search makes it easy to quickly find specific contents. As an additional innovation, it is now possible to document and save data like photos and notes, for example about injuries to persons or property damages and near accidents. These many useful functionalities also managed to impress on the education fair didacta. 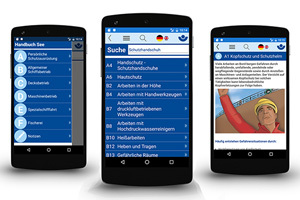 In the category knowledge management, The BG Verkehr was awarded the "eLearning Award 2018" for their app. 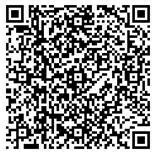 The app is now available for free download in the app stores for Android and iOS operating systems. For a long time, asbestos was considered a miracle product: the natural mineral is fire resistant, an insulator, easy to process and inexpensive. But asbestos causes illness and can give rise to cancer. BG Verkehr summarized the things shipping companies have to observe when they flag-in a ship that is contaminated with asbestos. Those who worked with asbestos in the past often used to breath in the dust and thereby the fine asbestos fibres. A possible result: malignant cancer tumours or changes in the lining of the lung. The employer's liability insurance associations recognize asbestos as a cause of a lung disease known as asbestosis, and as an occupational disease. Asbestosis is the most common cause of death among the terminal occupational diseases. There can be several decades between working with asbestos and the onset of the disease. On average the latency period is 38 years. Since 1993, asbestos may not be produced or used in Germany, and on a European level since 2005. From 2019 all ships under EU flag from 500 GT must have an inventory of hazardous materials, which must also include asbestos. With the Regulation EU/1257/2013 the EU legally implements the provisions of the Ship Recycling Convention (“Hong Kong Convention”). Globally, however, there is no ban on asbestos. So, there may still be asbestos present on older ships. If such a ship flags-in under the German flag, the shipowner will have to conduct a risk assessment, compile an asbestos cadaster and arrange mandatory medical check-ups for the seafarers. The prevention division at BG Verkehr has developed a compilation of the shipowner’s obligations when flagging-in a ship that is contaminated with asbestos (in German only). The maritime 24/7 hotline is offered by the Federal Maritime and Hydrographic Agency, BSH. In addition, the stand-by service of the Ship Safety Division of BG Verkehr is also available. More information is given under "Contact Details".